Signing in and getting information at the ARISE tent. Pastor Vivian Summerville, of the Oswego County Comets Motorcycle Riding Club, delivers the blessing. Oswego Mayor Billy Barlow addresses the large crowd of riders and volunteers. Pat McMahon thanks ARISE for the ramp program. The riders head out of the parking lot toward Route 104 to begin their trek. 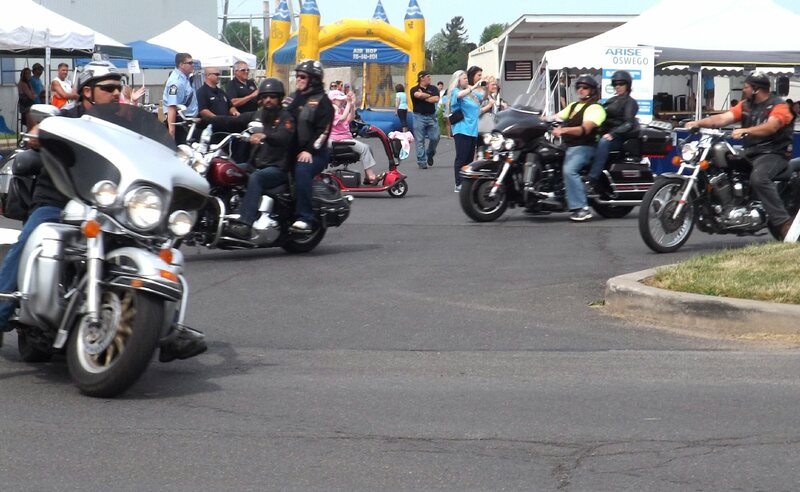 OSWEGO – ARISE revved up its annual Ride for Ramps program on Saturday. Members of ARISE and dozens of volunteers hosted the fundraiser with assistance from Lighthouse Lanes and Oswego Speedway. James Karasek of ARISE welcomes the riders and thanks them for taking part. Last year, in honor of the 25th year of the ADA proclamation, more than 100 motorcycle enthusiasts and around 80 motorcycles joined in to help raise funds for the ramps program. This year the number of motorcycles was down slightly to about 60. The group also had a 5-K run at Oswego Speedway, Sabine Ingerson, director of ARISE’s Oswego County offices, noted. ARISE has installed many ramps to ensure more and more people do have access to home environment, Karasek said. 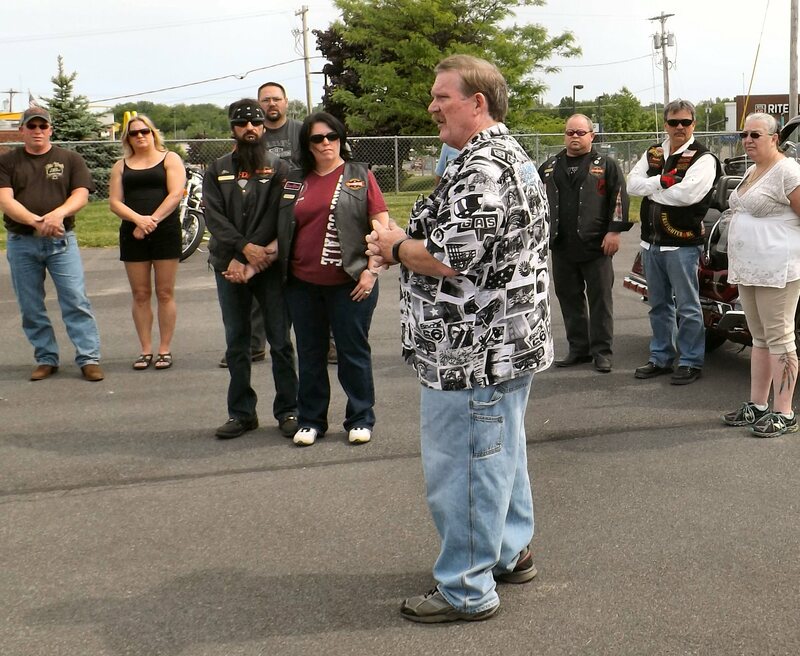 Pastor Vivian Summerville, of the Oswego County Comets Motorcycle Riding Club, delivered the blessing as the riders prepared to head out. Mayor Billy Barlow thanked the riders and volunteers for their efforts on behalf of the community. “And, thank you to ARISE for all that they do for the people in our community. We are lucky to have such a dedicated organization here,” he said. Six years ago, Karasek said he cooked hot dogs and hamburgers for six riders. The squadron of volunteers included members of the Oswego Police and Fire departments. Jason Noyes, who started the ride event eight years ago, thanked the nearly 60 motorcycle riders who showed up for Saturday’s event. The ARISE ramp program was started a few years ago at the First United Methodist Church in Oswego to take care of the needs of those that required a ramp for safe entry and exit from their home. As the program grew, First United partnered with ARISE to meet the growing requests that were coming in. Through the generosity of donors, ARISE funds the purchase of materials and then the process shifts back to the original start of the program. The First United Methodist Church has turned part of the basement into a work shop that constructs the ramp sections. “ARISE does the intake process, draws the plans and assembles the volunteers for the ramp build. The ramp then is assembled in schedule with the volunteers availability. We sometimes have company teams that come together for a volunteer day, a team building exercise, or just for the concept of returning to the community. We welcome each of these teams,” Karasek explained. The Ride for Ramps is the annual fundraiser for the program. The event offered a choice of a chicken BBQ or pulled pork. There were activities for the kids and adults. ARISE is a non-profit Independent Living Center run by and for people with disabilities. The organization has been providing advocacy and services since 1979. Each year ARISE works with approximately 4,000 people of all ages who have all types of disabilities. ARISE has offices in Onondaga, Oswego, Madison, Cayuga, and Seneca counties and operates ARISE at the Farm, a 77-acre recreational facility in Chittenango, and ARISE and Ski at Toggenburg Winter Sports Center in Fabius.